Israel's propaganda is becoming so transparent and boring. And Washington's propaganda is totally amateurish and absurd. Who was really behind this latest incident in Beirut that has triggered violent clashes in the streets? As always, we must look to the Mossad because of the numerous historical examples of Mossad false flags in its region and around the world. The motive is clear. The insane oligarchical governments of the U.S. and Israel are seeking to create a new civil war in Lebanon. They are exporting terrorism to Syria and exploiting the sectarian divisions in Lebanese society. "Hezbollah, Syria, and Iran have all condemned the bombing and cite it as a provocation to start a greater sectarian war, from which none will benefit. Each in turn suspect Israel and the West, as greater sectarian tension is expected to result, playing into long documented attempts by US, Israel, and Saudi Arabia to trigger a sectarian war they hope will be the downfall of Hezbollah, Syria, and Iran. Suspicious op-eds in pro-Western "Lebanon Now" insist that Syria is responsible, and again without evidence, concludes that blaming Israel is inappropriate, and that the Wall Street-London militant beachhead is by far a lesser threat to Lebanon than what it calls "the most deadly virus" of President Bashar al-Assad's Syria. 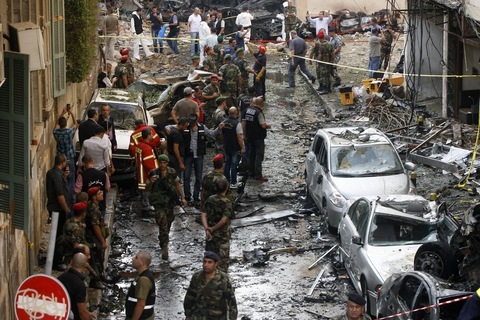 The blast has given impetus to Hariri's mobs to flood into the streets, who will no doubt portray themselves to be as "spontaneous" and "independent" as US-engineered mobs were throughout the equally premeditated "Arab Spring." Hariri in 2007 was, according to US journalist Seymour Hersh, building an armed militant front in northern Lebanon, across the boarder from Homs, Syria. Many of these militants admittedly had direct ties to Al Qaeda, and with US, Israeli, and Saudi support, they were continuously armed, funded, and prepared for the sectarian bloodbath now unfolding. Homs to this day remains as one of the strongholds for terrorist militants operating in Syria."